Albion were held to a frustrating 0-0 home draw by fellow Championship high-flyers Sheffield Wednesday this evening. The Seagulls failed to have a shot on target but they moved up a place to third in the table, two points behind second-placed Middlesbrough, who lost 1-0 at Rotherham. Leaders Burnley extended their lead at the top to five points with a 3-2 victory at Fulham. Wednesday, who kept a fifth successive clean sheet against Brighton, remain sixth in the table, nine points behind Albion with ten games to go. Kick-off was delayed by 15 minutes owing to congestion on the roads after a number of accidents on the A27 and chances were few and far between when the action got underway. After a quiet opening, Albion winger Jamie Murphy let fly from 25 yards on 15 minutes but his shot took a slight deflection and went just over. The visitors’ Lucas Joao was booked for a scuffle with Connor Goldson on 35 minutes as Albion struggled to get through a well-organised Wednesday defence in the first half. It was Murphy who again had the next opening when Anthony Knockaert’s cross was only half cleared but he flashed the ball wide of the far post from the edge of the penalty area on 42 minutes. Wednesday’s only shot of the half came just before the break but Kieran Lee dragged his effort well wide from distance. The visitors went close to opening the scoring on 51 minutes but Albion keeper David Stockdale dived full stretch to his right to keep out Barry Bannan’s curling effort from 22 yards. Albion introduced Bobby Zamora and Kazenga LuaLua with just over 20 minutes to go as they looked to push for a winner. 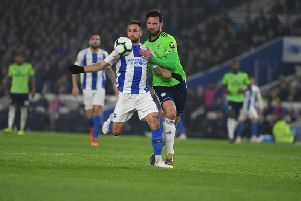 Wednesday had the next opportunity, though, as Albion twice failed to clear their lines and Stockdale got well down to his left to keep out Bannan’s fierce strike. Brighton then brought on Manchester United loanee James Wilson 15 minutes from time but it was Wednesday who applied more of the pressure late on. However, the Albion defence stood firm and kept a fourth successive clean sheet. BRIGHTON: Stockdale; Bruno, Goldson, Dunk, Rosenior; Knockaert (Zamora 68), Sidwell, Stephens, Murphy; Hemed (LuaLua 69), Baldock (Wilson 76). Subs: Maenpaa, Greer, Kayal, Bong. WEDNESDAY: Westwood, Palmer, Hutchinson, Loovens, Matias (Wallace 83), Bennett, Hooper, Lees, Joao (Nuhiu 66), Lee, Bannan. Subs: Price, McGugan, Lopez, Sasso, Pudil.